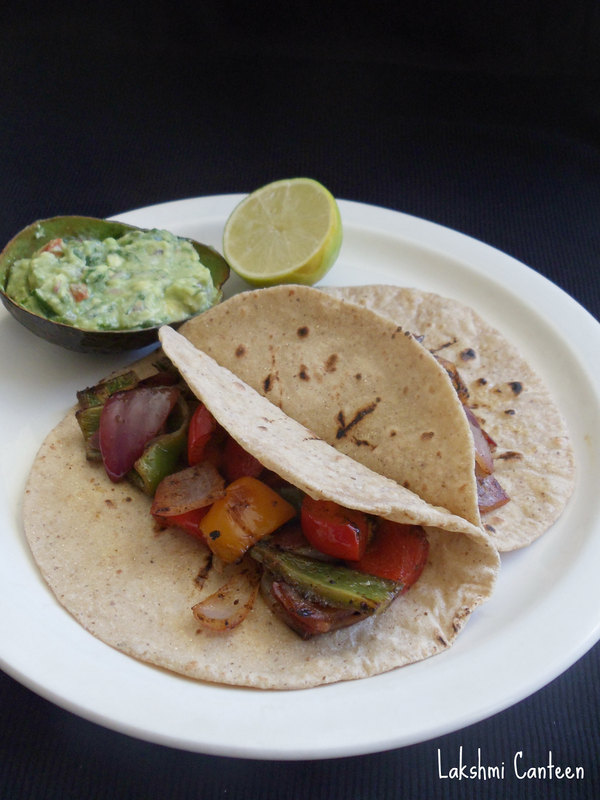 Veggie Fajitas is one of the dishes which I make very often from a long time. 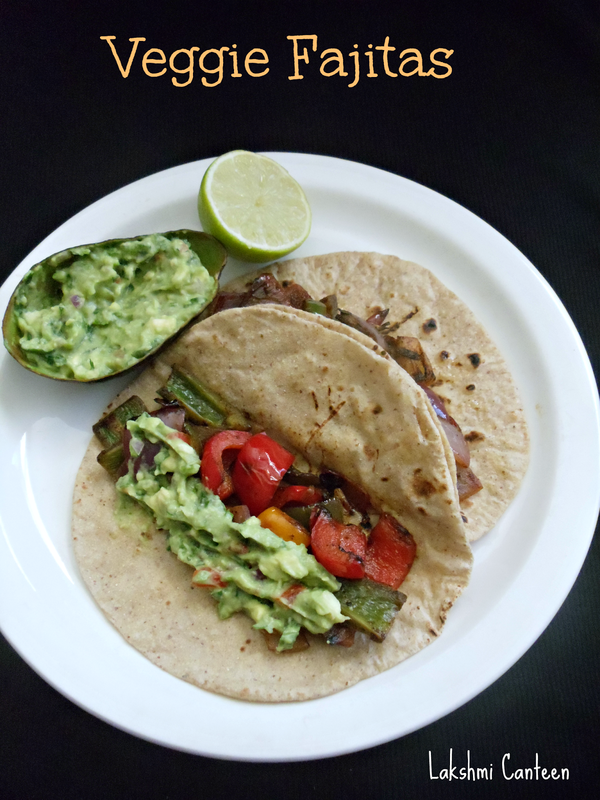 I used to stir fry bell pepper and onions, place them in tortilla and top it off with guacamole. Then I started to look for a variation as I got bored of this dish. So as I started to look up for recipes, I stumbled upon this recipe. 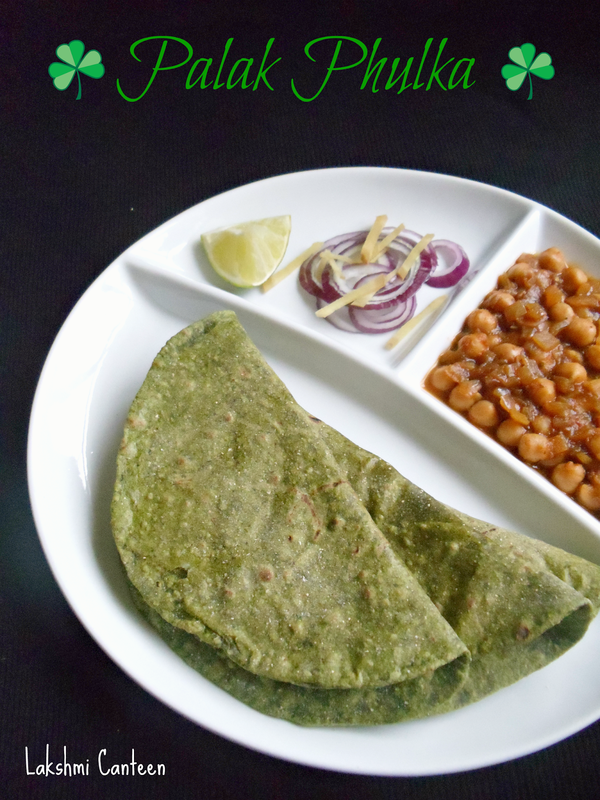 It looked very promising and hence I tried making it. We fell in love with the marinade and have been making it almost 2 times a week since then. Note: Taste the marinade and add more lime juice or spice powder, if desired. 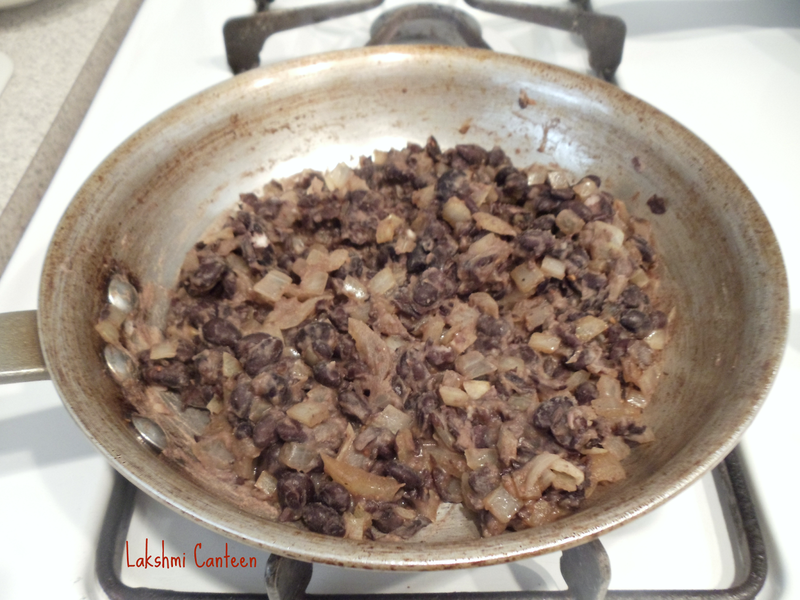 You can also use portobello mushroom along with the peppers. But make sure you marinate the mushrooms in a different bowl and saute it separately. This is because mushroom has way too much moisture and makes the other veggies soggy. 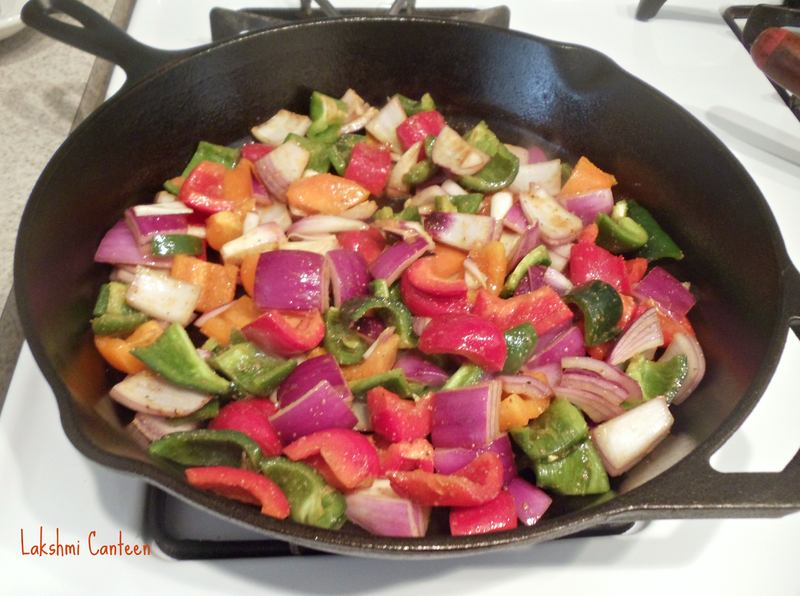 Chop the onion, bell peppers, poblano and jalapeño. You can slice it but we like it in cubes. Transfer the chopped veggies into a mixing bowl. Preparing the marinade - Add all the ingredients listed under 'For Marinade' in a small bowl. Mix well. Marinade is ready. 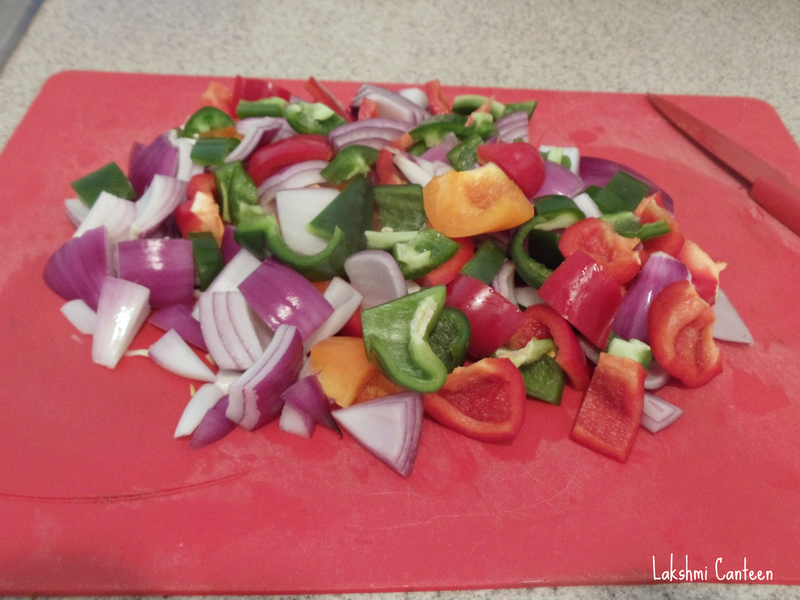 Now add this marinade over the chopped veggies and mix it gently so that all of them get an even coating. Set it aside for 10- 15 minutes. Meanwhile prepare the guacamole and stick it in the refrigerator until required. 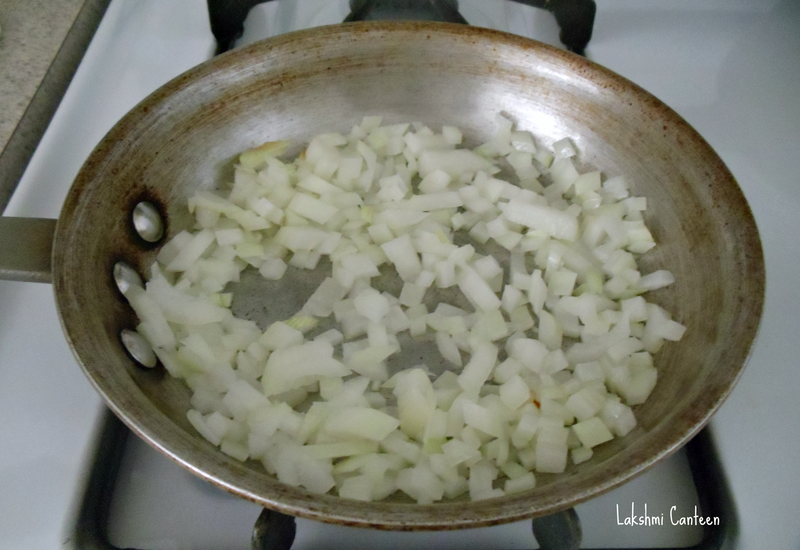 Now heat a wide pan (I used cast iron pan). 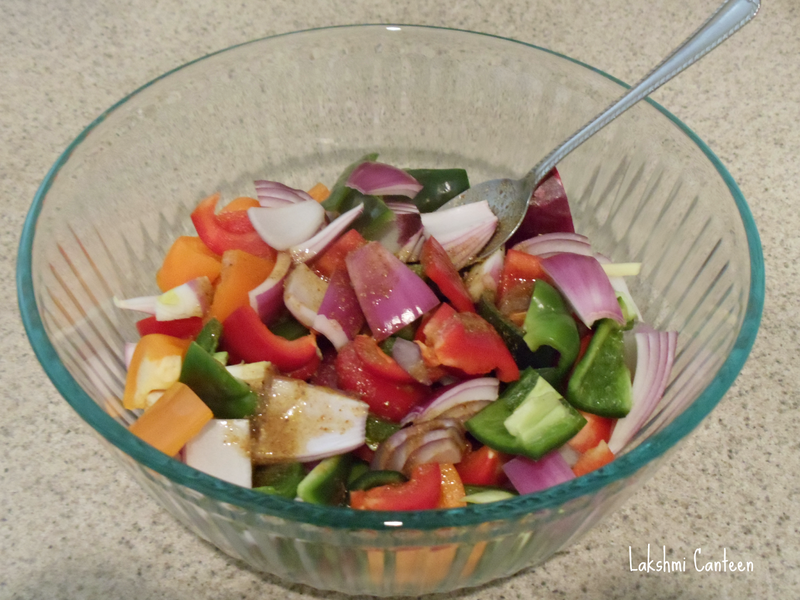 Once hot, add in the marinated veggies. 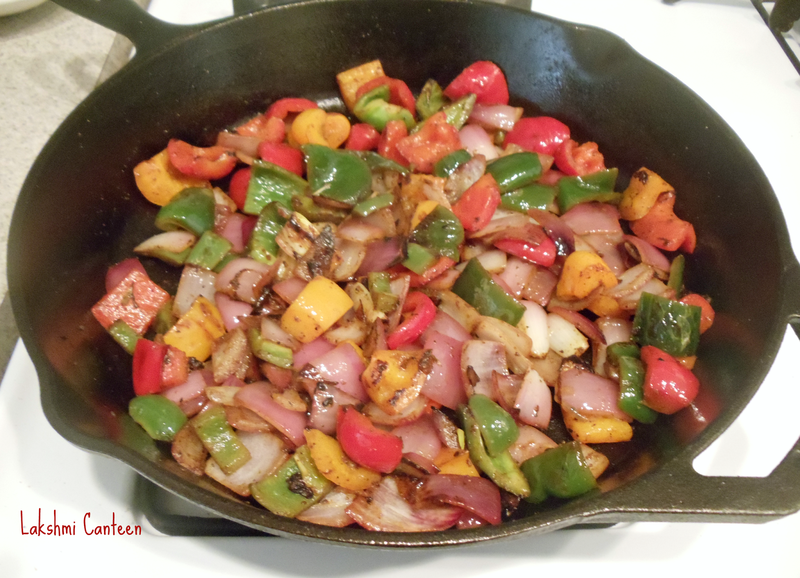 Saute it until a few pieces starts to get charred (you can saute the veggies until your heart desires. We like it little bit on the charred side). Then turn off the heat. 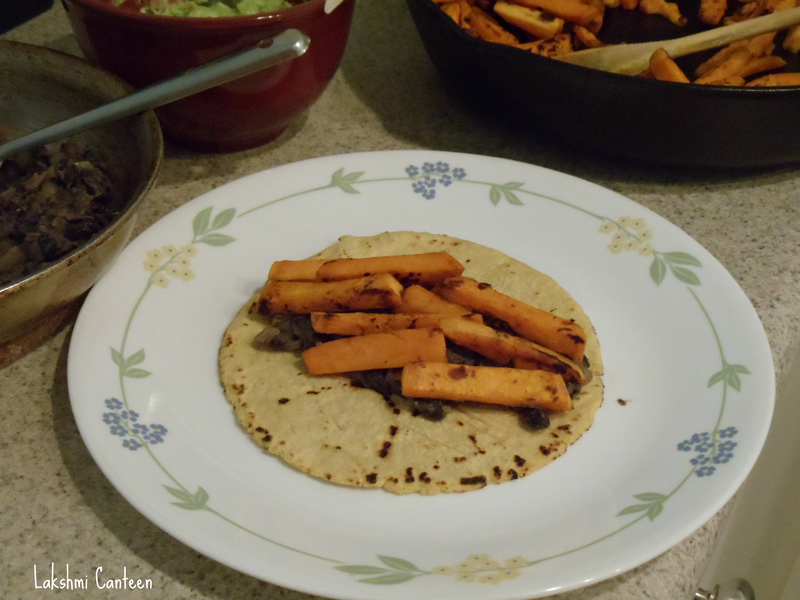 For Assembling: Warm the tortillas in a microwave or on direct flame. 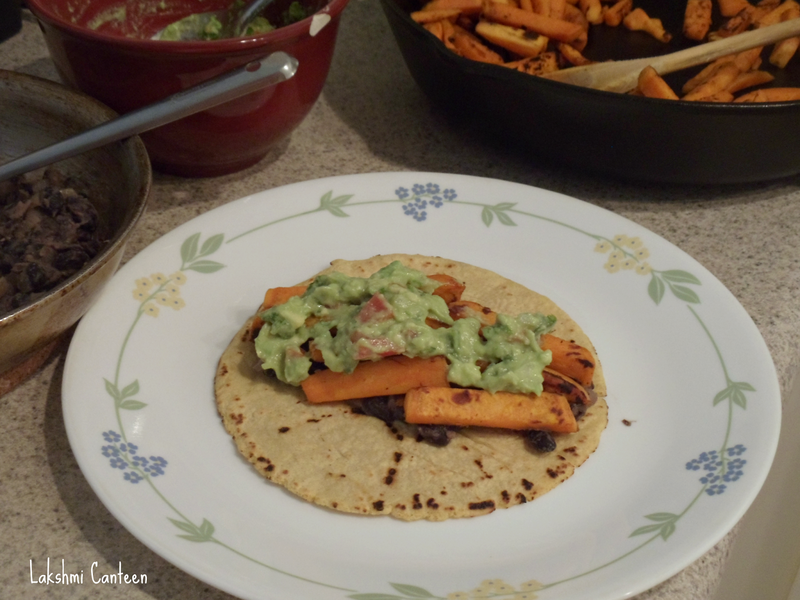 Then place little amount of the sauted veggie mixture on the middle of the tortilla. 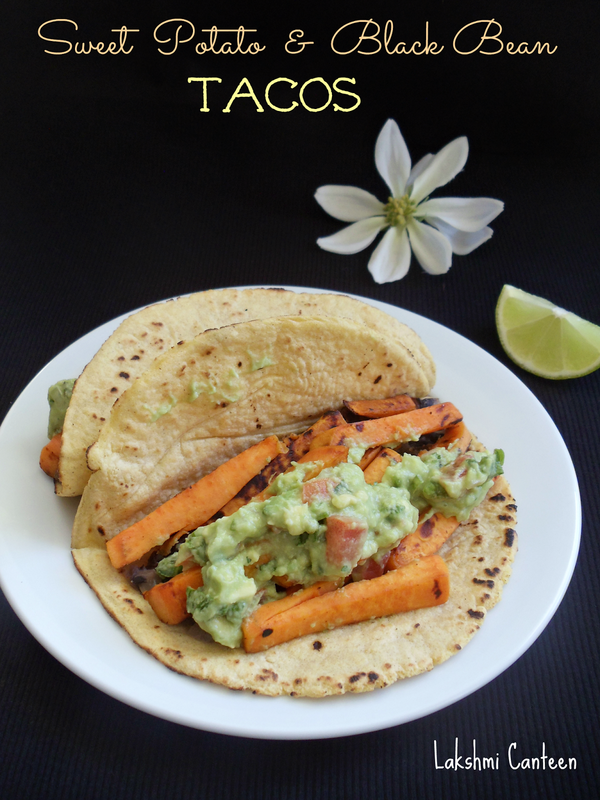 Then top it off with desired toppings like guacamole, pica de gallo, cheese, sour cream, lettuce etc. Repeat with the rest of the tortillas. 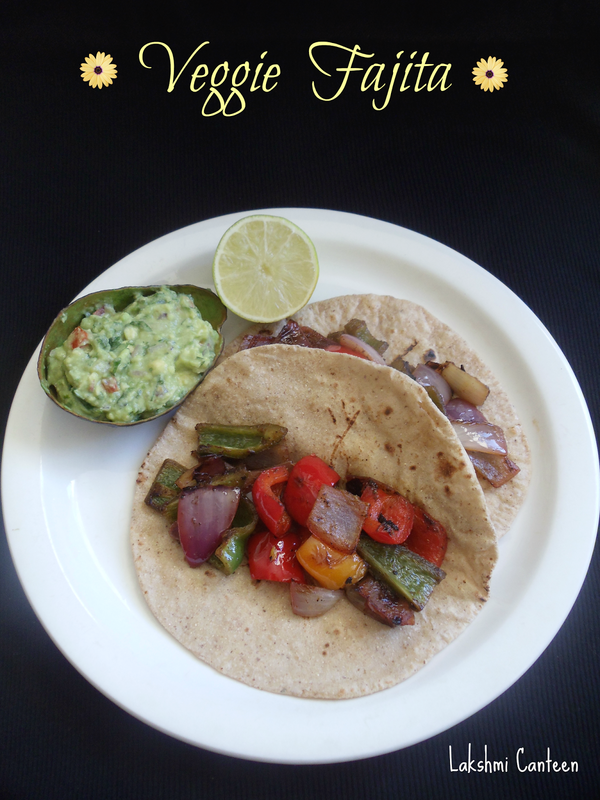 Veggie Fajitas is ready! Serve it warm. Above measurement serves two. 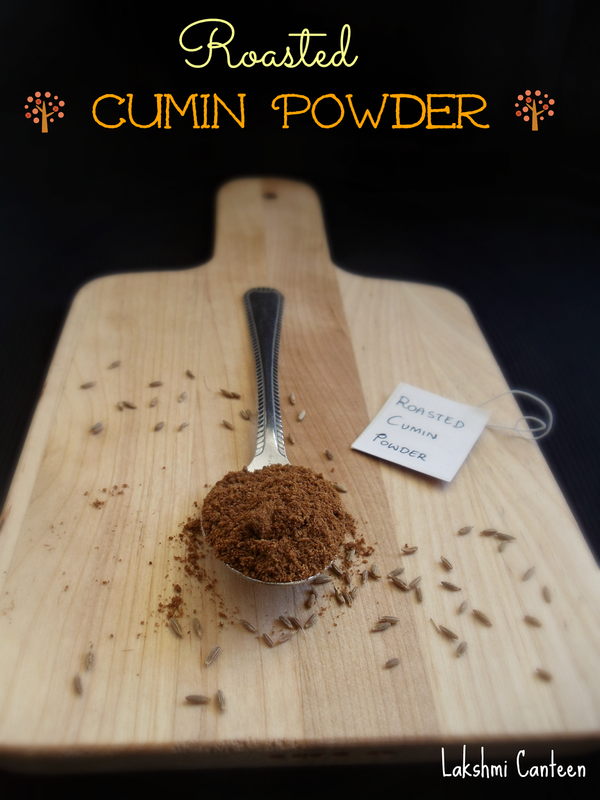 Cumin is one of my favorite spices. Roasting the spice, brings out the flavor. Hence I always make this powder in small batches and use it in Chaas, Chaats etc. A little sprinkling of this powder elevates the dish. 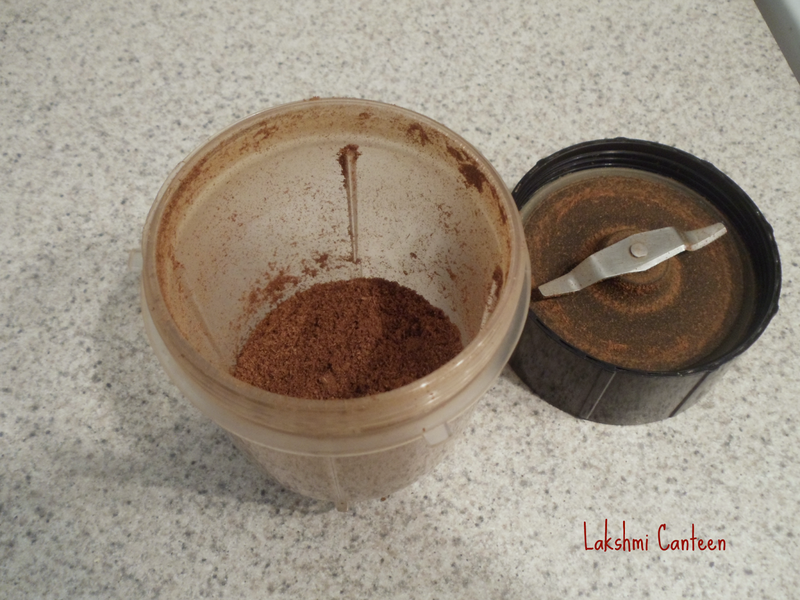 Making this powder requires only few minutes. Once you start using this powder, you will never want to buy it from the stores. 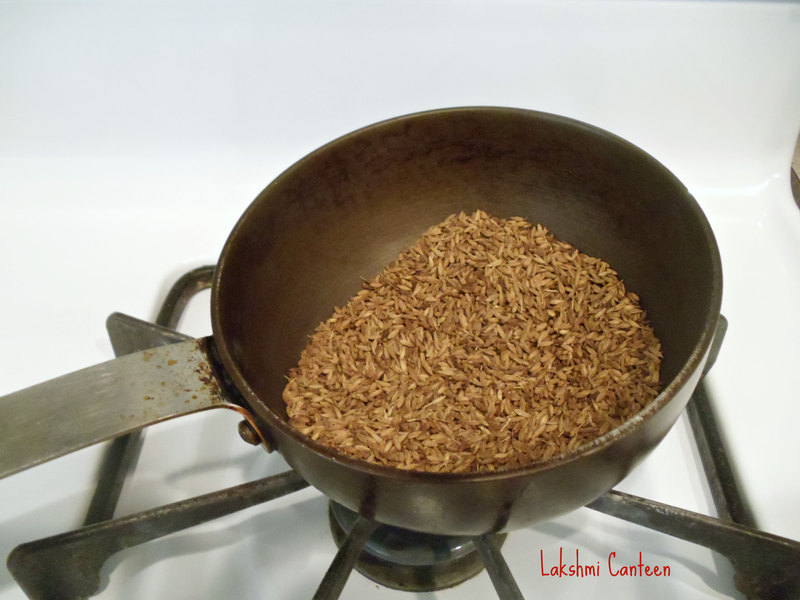 Take cumin seeds in a frying pan. 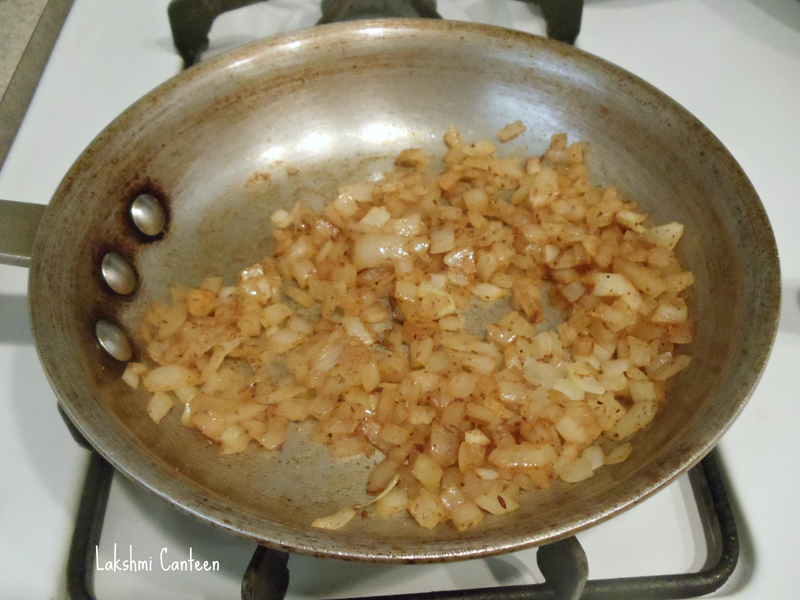 Start frying it on medium heat until it turns brown and fragrant. Keep stirring constantly for even browning. Once done, turn off the heat and transfer to a bowl. Allow it to cool completely. Then transfer it into a blender. Transfer it into an airtight container. 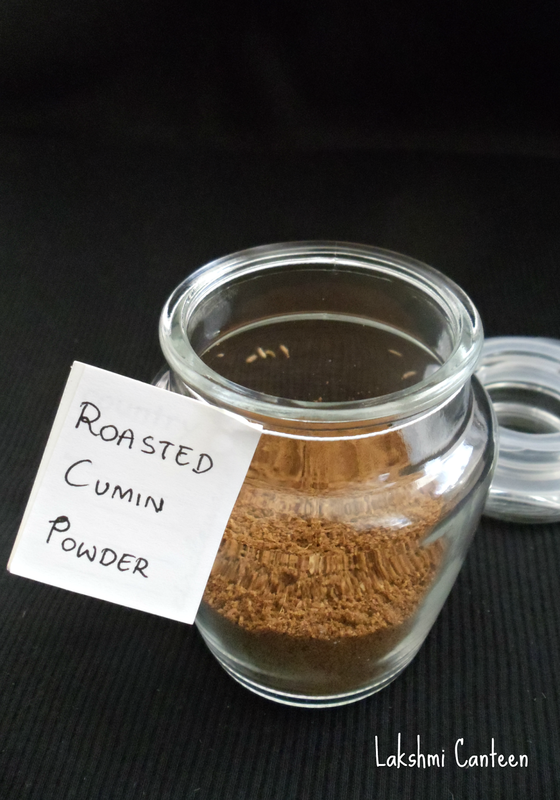 Roasted Cumin powder is ready!! Use this powder in Chaas, chaats etc. This powder stays good up to several months. 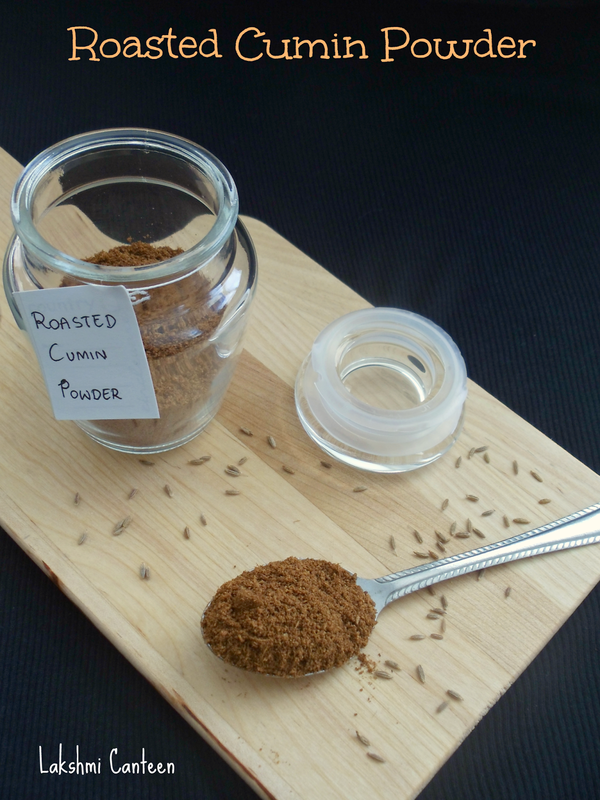 Notes: #Flavor of cumin powder decreases with time. So make small batch of powder as needed. 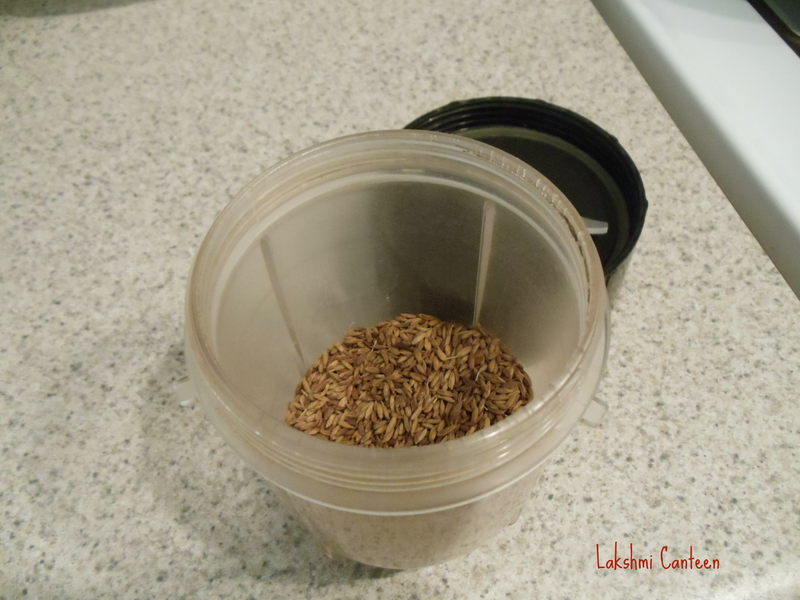 #You can also use a mortar and pestle to crush the roasted cumin seeds. 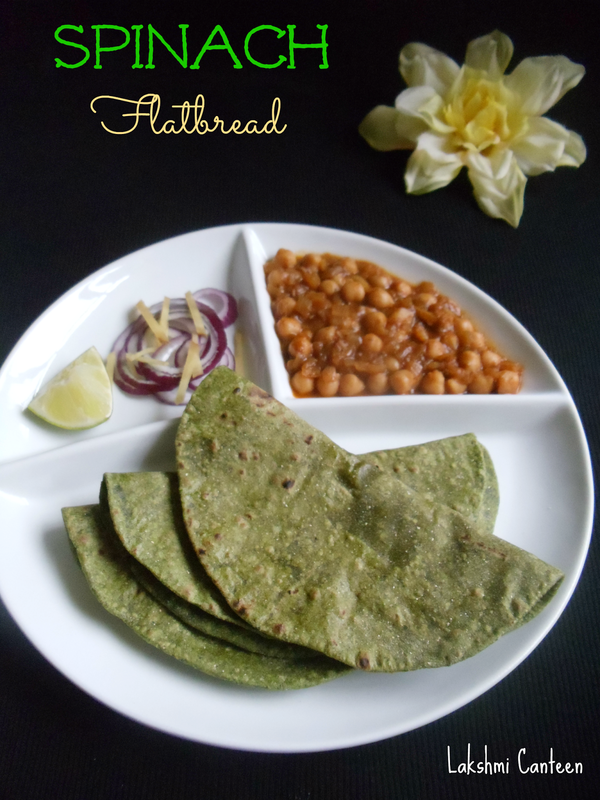 Phulka is an unleavened flatbread. 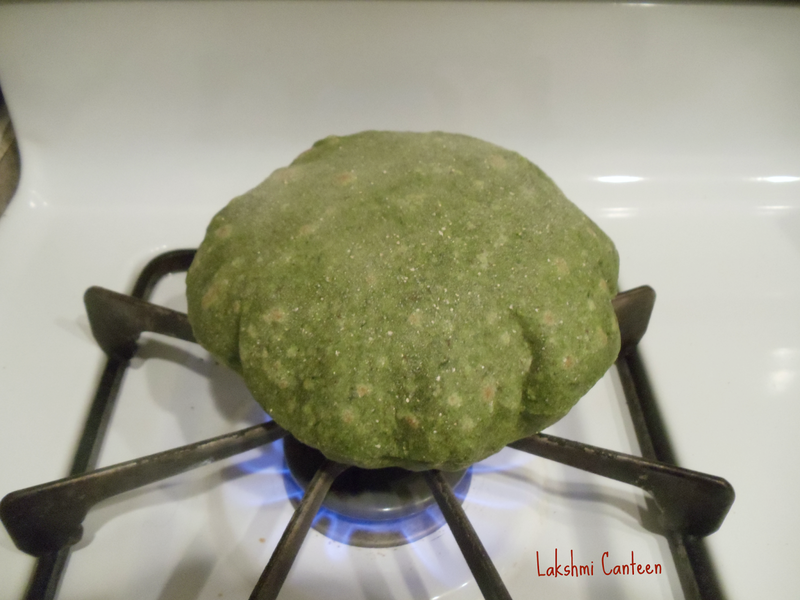 The rolled dough is partly cooked on a skillet and then put directly on a high flame, which makes them blow up like a balloon. 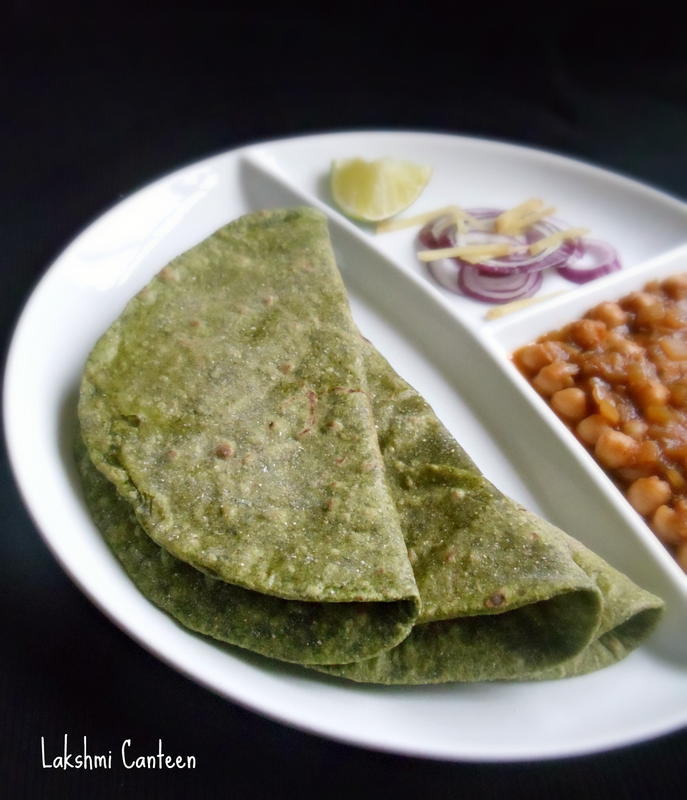 It is very commonly prepared in northern parts of India. Being a South Indian, rice is our staple. 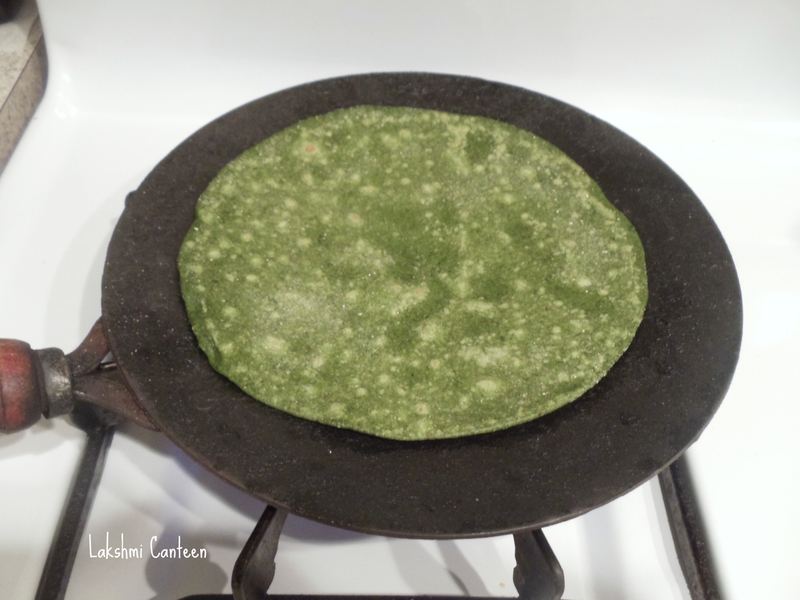 But for health reasons, I make this flatbread every night. 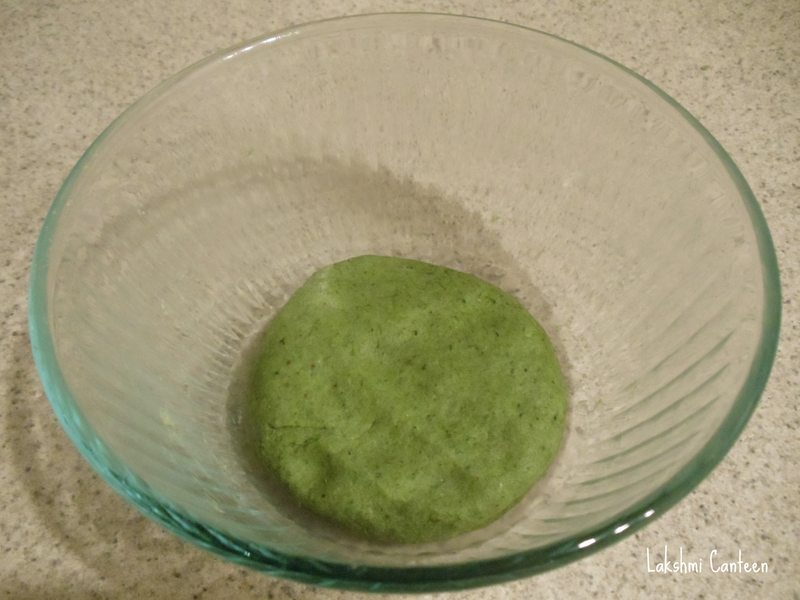 To make it even more healthier I sometimes add spinach puree. 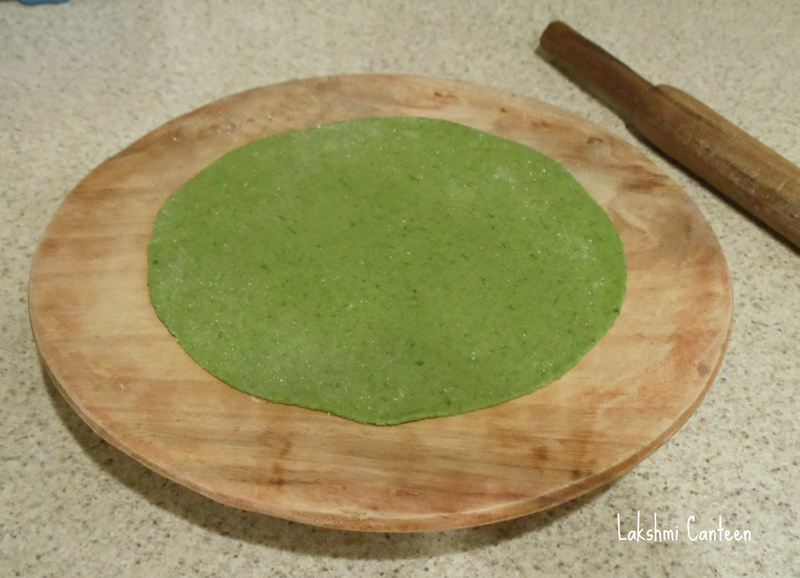 It looks good and makes it easier for a person like me who doesn't like spinach. Do try making this and enjoy! Heat 1/4 cup of water. 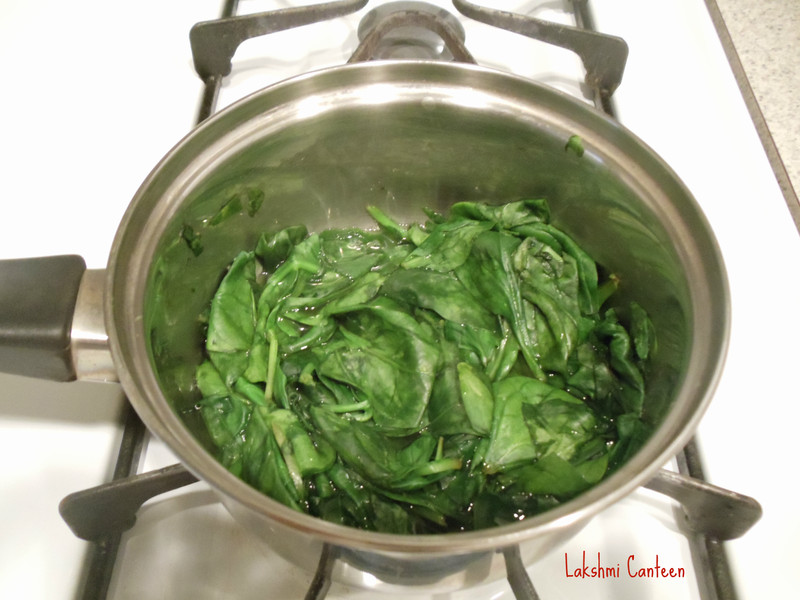 Once hot add in the washed spinach leaves. Once it wilts, turn off the heat. Allow it to cool. 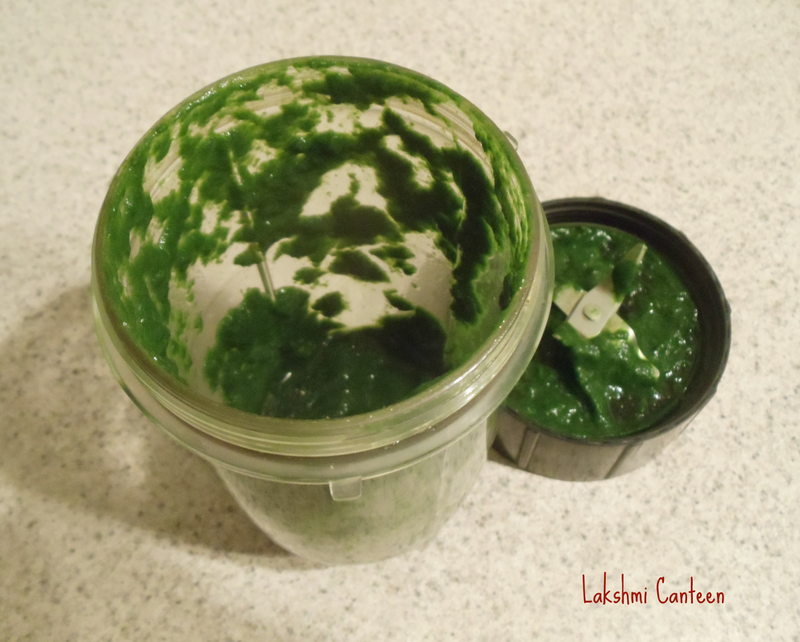 Once it cools, transfer the leaves (leaving behind the water) to a blender and make a fine paste. 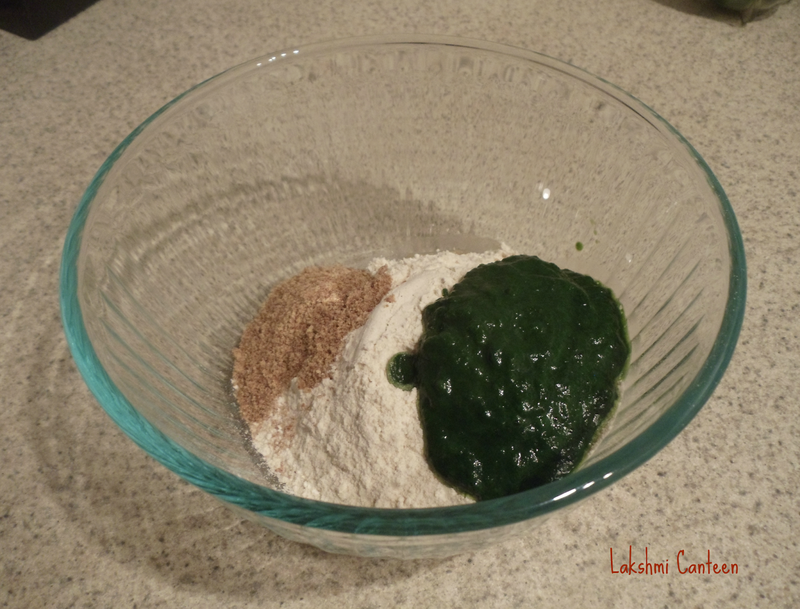 Now in a mixing bowl, add flour, oil, flax seed powder, palak puree, salt. Mix gently and work in so as to get a soft, non-sticky dough. Add water, if required. Once done, add few drops of oil on the dough and spread it so that it forms a coating and prevents it from drying. Let the dough rest for 10- 15 minutes. Then divide the dough into six equal portions. 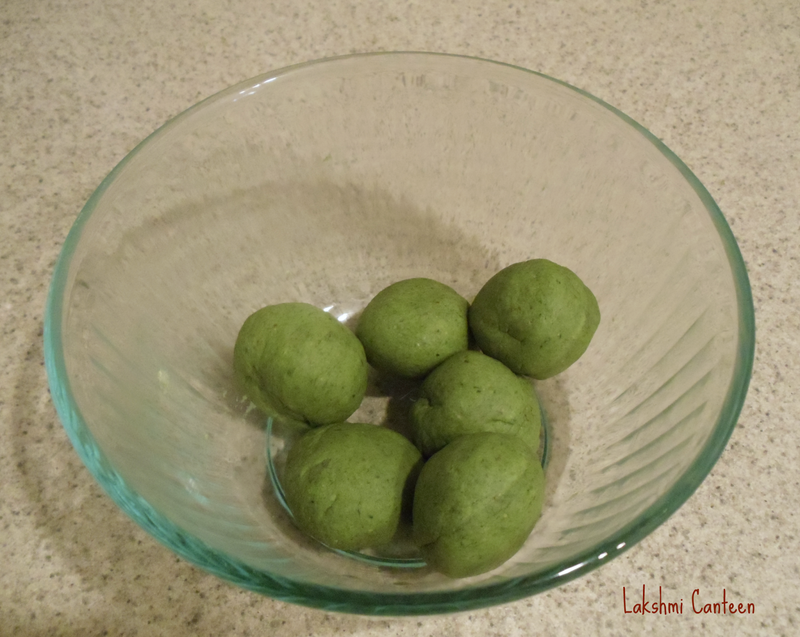 Dip one of the dough ball in dry flour and start rolling it into a circle of diameter 6-7 inches. Roll rest of the dough balls. 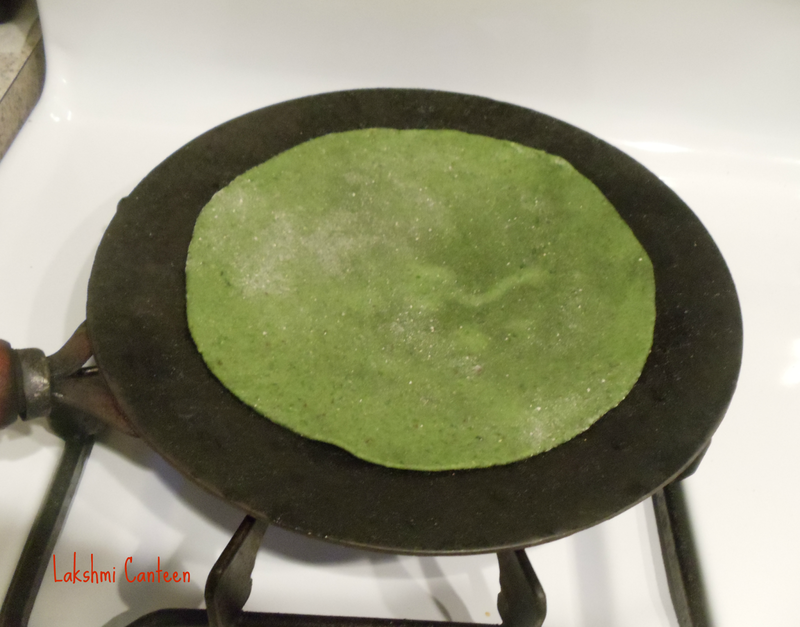 Then place one of the rolled flatbread on a preheated skillet. Once it is slightly starts getting light brown spots, flip it to repeat on the other side. Then transfer it on direct flame using tongs, until it puffs up. Once done transfer to a closed container lined with paper towel or kitchen towel. Continue with the rest of them. Serve it with any curry of your choice. Above measurement makes six phulkas. 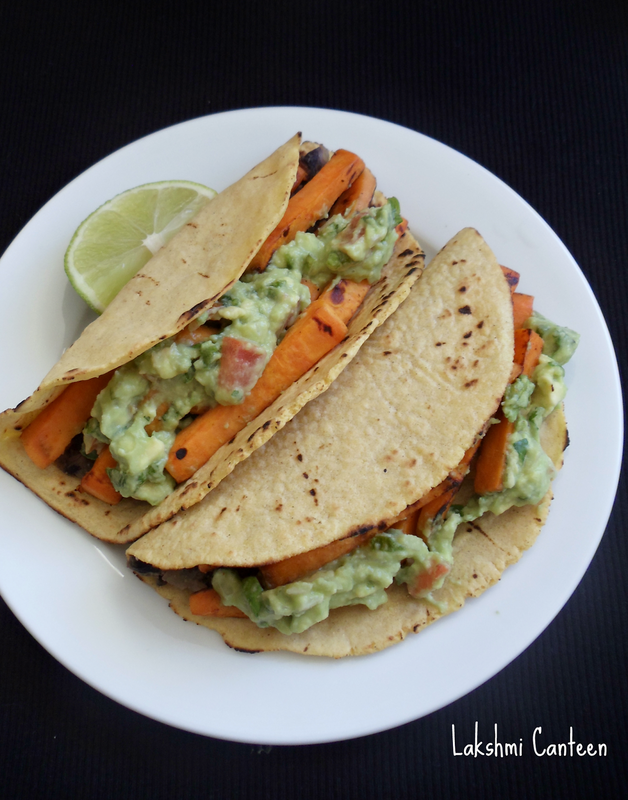 After posting the recipes for soup and quesadilla, you must be thinking that this girl is obsessed with sweet potato and back beans. And yes, I am so in love with them. Until couple of years, I was not a great fan of sweet potato. I once bought it and tried making fries. It tasted so good that I started to buy sweet potatoes often. Once it so happened that I stumbled upon this recipe. I tried it with less confidence as I was not sure how it would turn out. Surprisingly they turned out so tasty that I make it quite often now. Do give this a try and let me know how it turned out for you! Prepare the guacamole and stick it in the refrigerator until required. 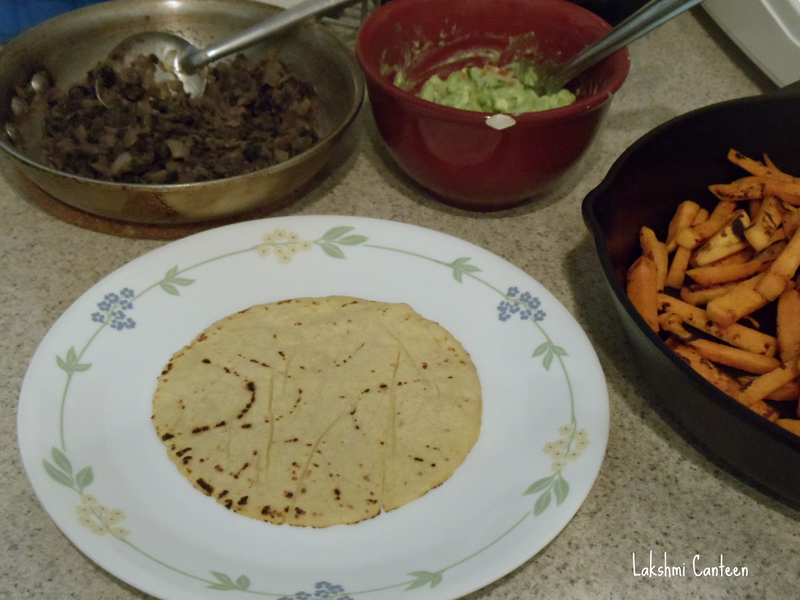 I also made corn tortillas beforehand and stored in a tortilla warmer. 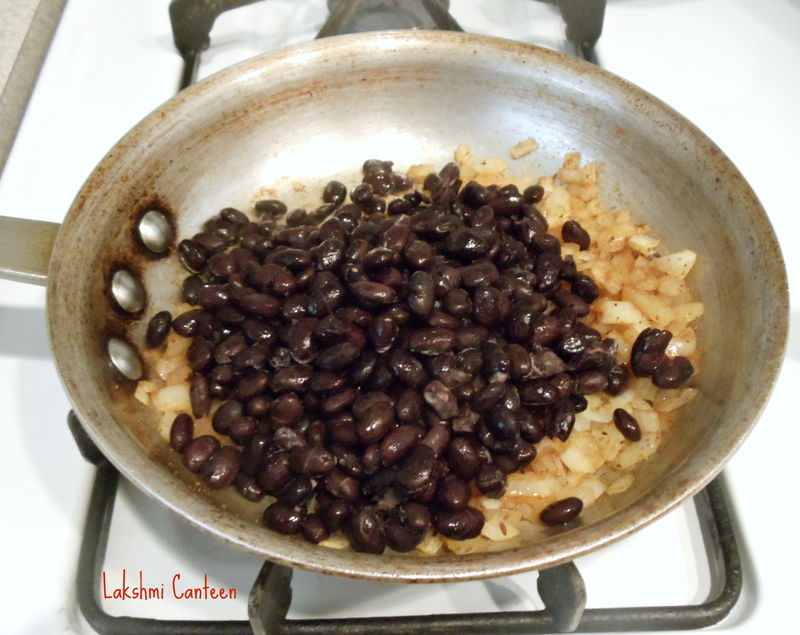 Mix well and smash half of the beans using a fork. Wash the sweet potato and peel it. Then chop it into desired shape and size. 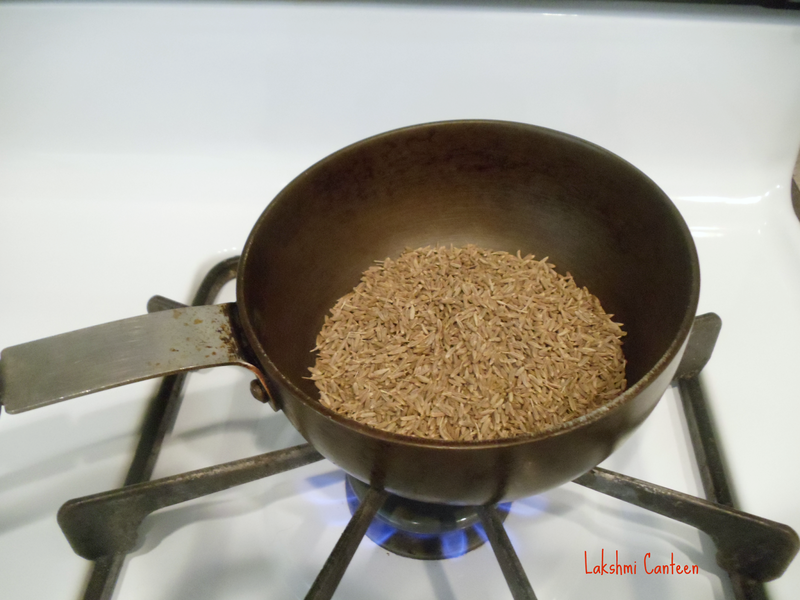 Then heat oil in a skillet (I used Cast iron). 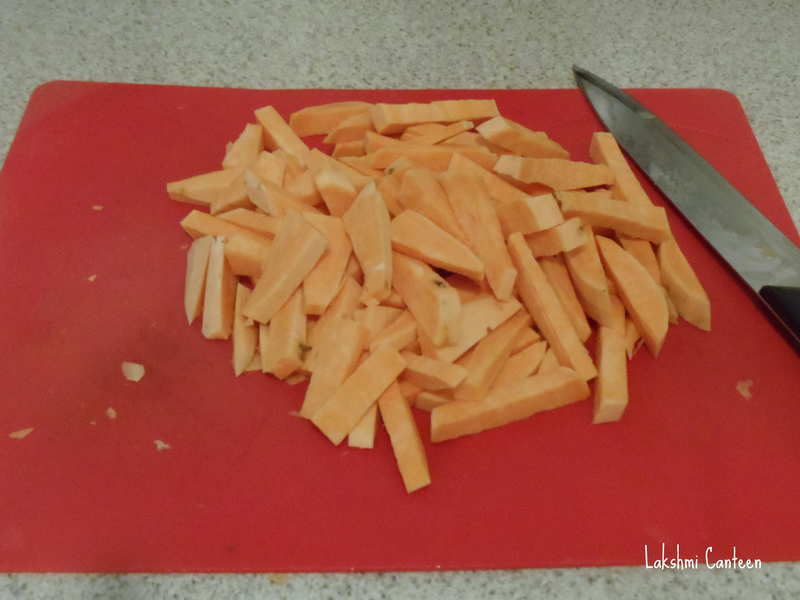 Once hot, add in the chopped sweet potato pieces . Sprinkle salt and red chilli powder. Roast the sweet potato pieces until tender and caramelized at the edges (alternatively you can roast the sweet potatoes at 425F temperature, in an oven). Now place a tortilla on a plate. 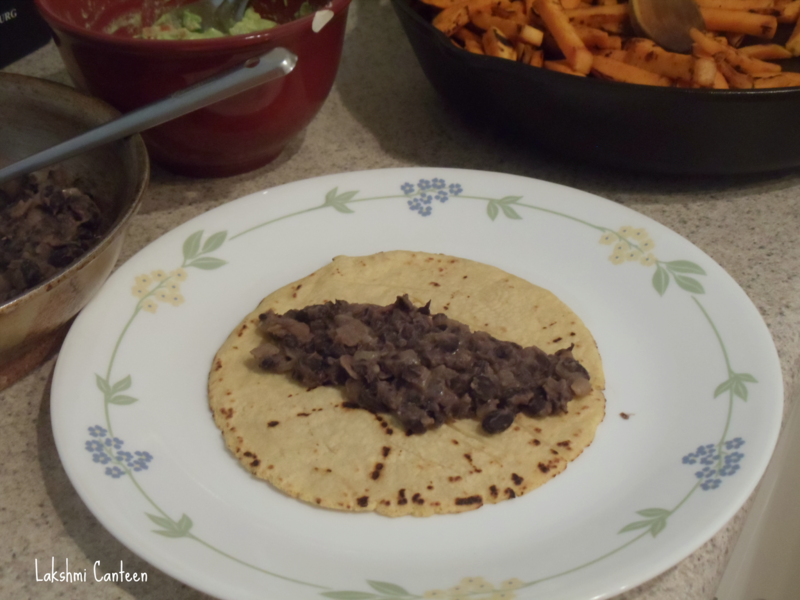 Then spread the bean mixture on the middle of the tortilla. 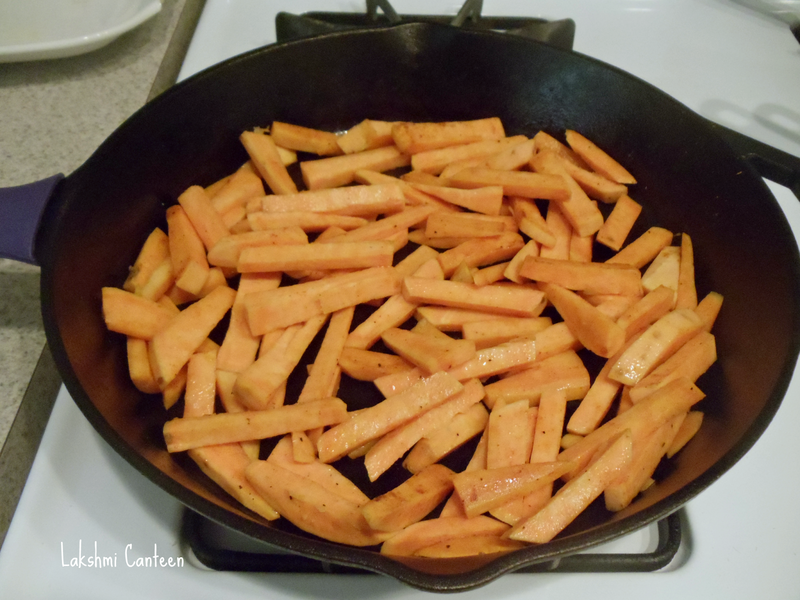 Then place roasted sweet potato pieces. Finally top it off with guacamole. Garnish with fresh lime juice and continue with the rest of them. 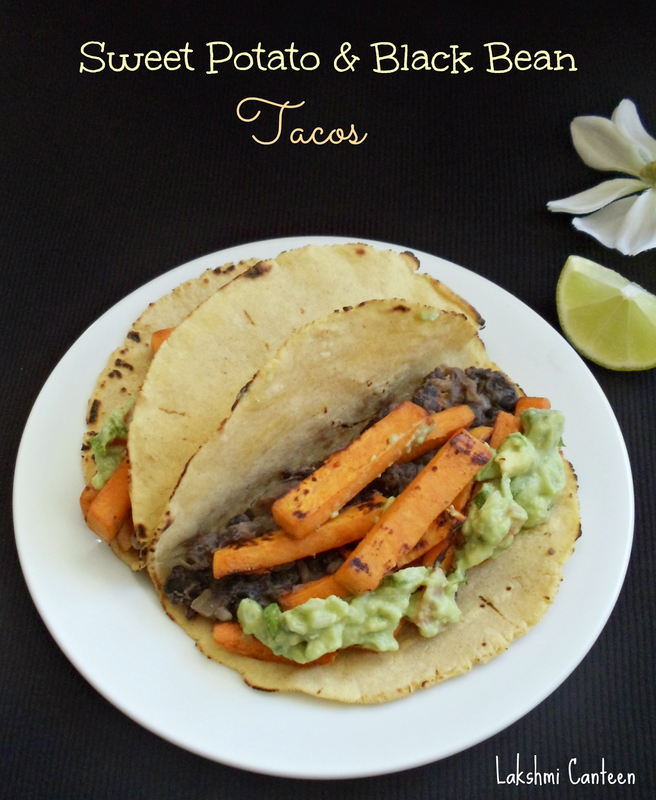 Sweet Potato and Black Bean Tacos are ready!! Serve it immediately. Above measurement serves two.